Spreading my wings in cultural awareness of Middle Eastern Cuisine has taken me to cookbooks by Yotam Ottolenghi. In partnership with Sami Tamimi he wrote the cookbook Jerusalem, his home city, which reflects the diverse cuisines of the Muslims, Christians and Jewish communities within its borders. Now a well known vegetarian chef and restaurant owner in London, Ottolenghi has received many awards for his innovative cuisine. More cookbooks followed among them Plenty and Plenty More. 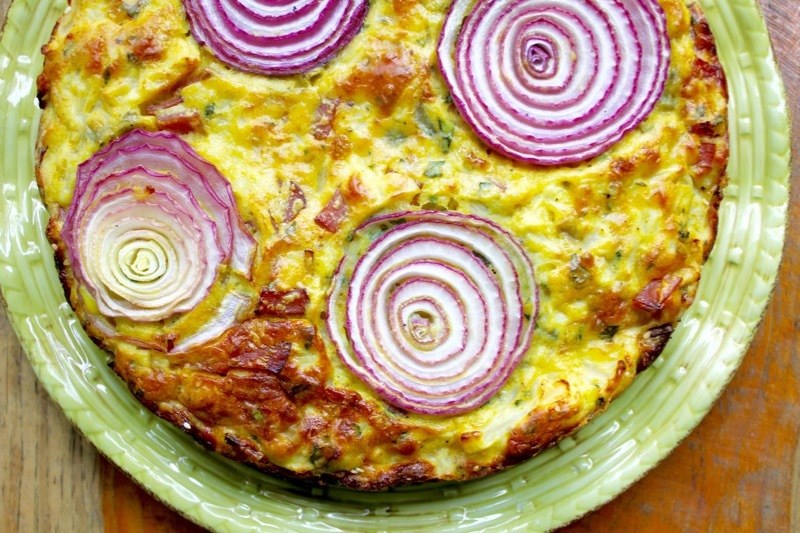 From the cookbook Plenty More, I made this savory Cauliflower Cake. Many of Ottolenghi’s recipes require unusual ingredients, but this is a pretty straightforward recipe. The only ingredient that I did not have access to was nigella seeds. As they are only sprinkled on the sides of the cake along with sesame seeds, I did not consider them necessary. We love this cake. 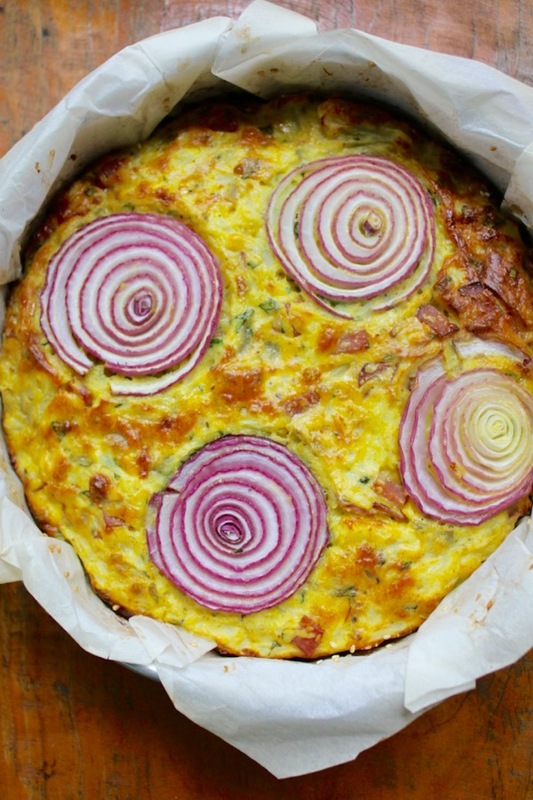 Cauliflower florets are suspended in an eggy cake batter with flecks of rosemary, basil and red onions. To make it even better in my mind, I added cubes of ham. But you could leave it vegetarian and it would still be delicious. There is added richness with lots of Parmesan cheese. I think an aged cheddar would also be good. I will be looking for nigella seeds because some reviewers said the seeds on the edges added a nice crunch. You can serve this cake along with a salad for a light supper or make it for a brunch with friends. It makes me happy. Enjoy the coming Father’s Day weekend. Line the base and sides of a 9 1/2-inch/24-cm springform cake pan with parchment paper. Brush the sides with melted butter, then mix together the sesame and nigella seeds and toss them around the inside of the pan so that they stick to the sides. Pour the cauliflower mixture into the pan, spreading it evenly, and arrange the reserved onion rings on top. Place in the center of the oven and bake for 45 minutes, until golden brown and set; a knife inserted into the center of the cake should come out clean. Remove from the oven and leave for at least 20 minutes before serving. It needs to be served just warm, rather than hot, or at room temperature. Posted on June 15, 2017 at 9:52 am. 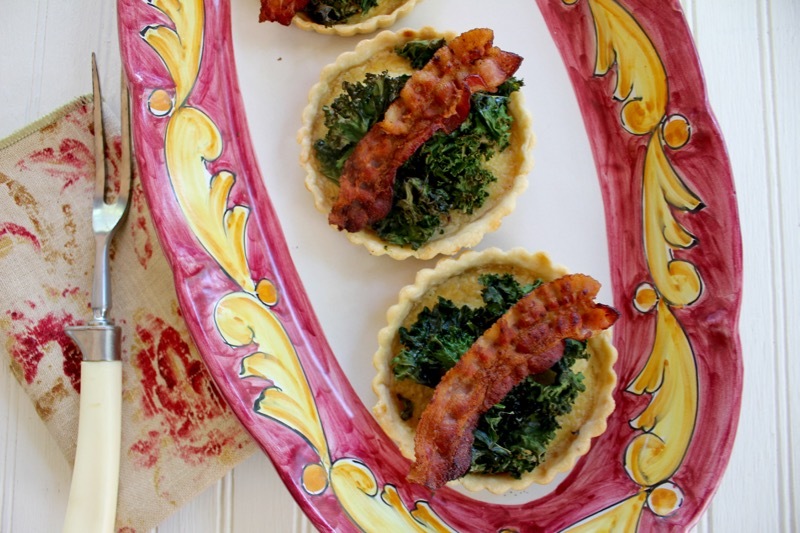 Tartlets and quiches are some of my favorite foods. Add crispy kale and bacon and I am in heaven. While scrolling the internet, I found a blogger who had attended one of Mimi Thorisson’s pop-up dinners in France. 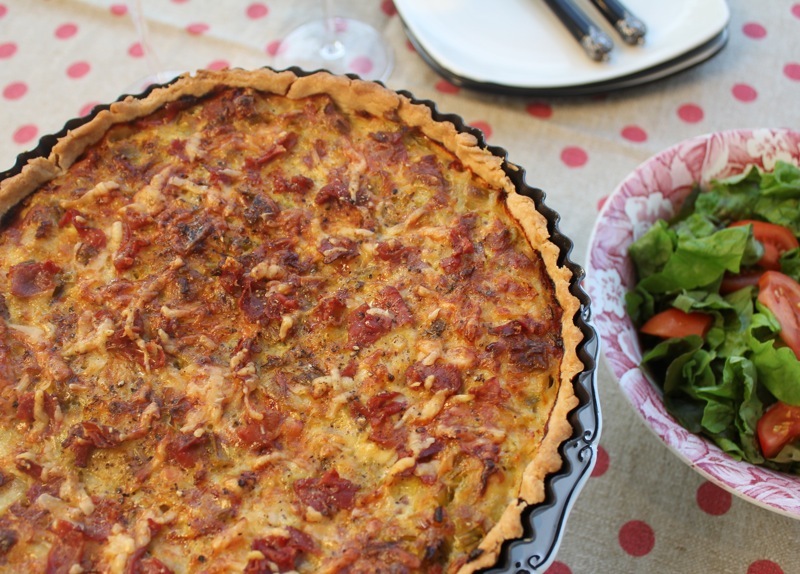 Mimi, of the blog Manger, has served dinner to many people in her home in Saint-Yzans-de-Médoc in the Bordeaux region of France. The blogger showed a picture of the appetizer that was offered that night. It was this tartlet. I knew that I had to make it, so I searched Mimi’s blog and found it here. I kept the concept of the dish but changed it up to suit my taste. I wanted more custard and used heavy cream instead of crème fraîche. The kale is indeed crispy. It is added near the end of the cooking time. 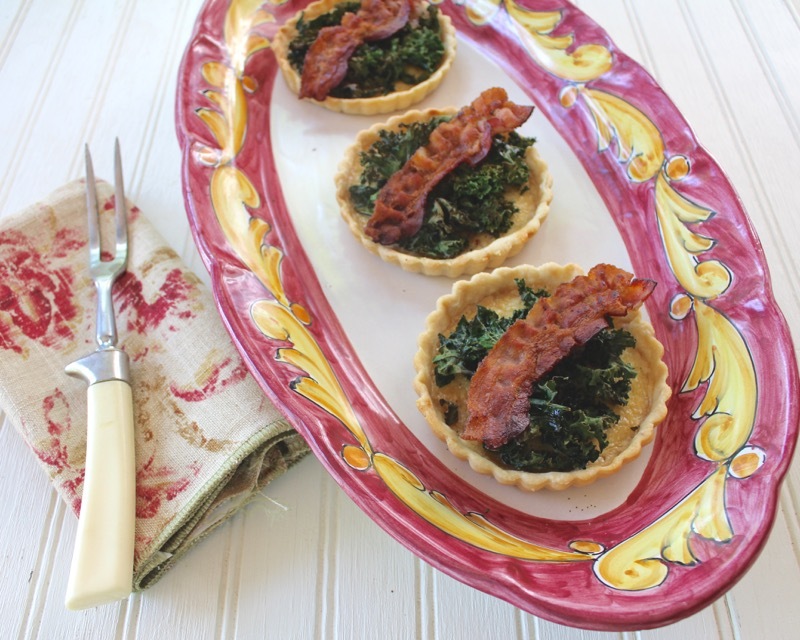 It provides a surprise element to a simple tartlet. 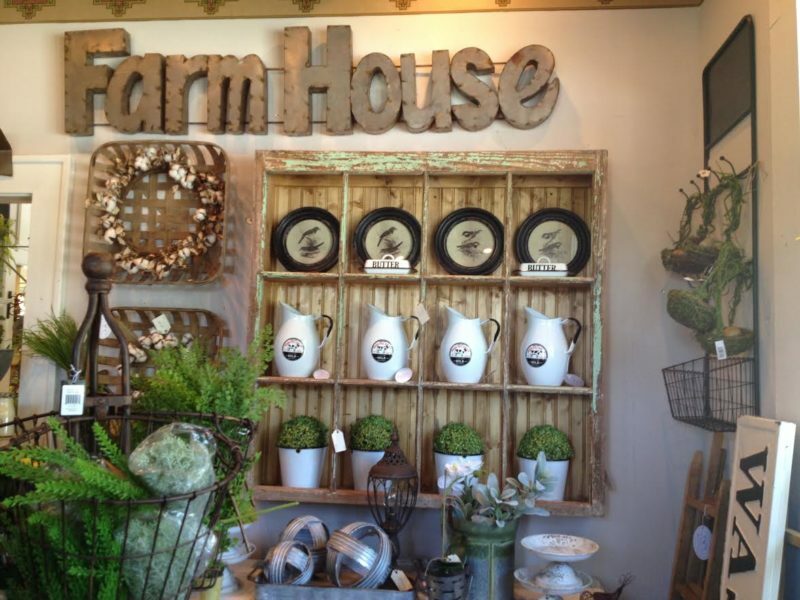 Penny of Enjoying the Simple Things and I found a new shop in Hendersonville for all of you who love the “Fixer Upper” look of Joanna Gaines. The shop is called Southern Chicks Market. It is full of tempting merchandise. I think you will also find these delicious tartlets tempting. Pastry – Enough for a single 9 inch pie pan cut into 6 rounds large enough to fill 6 tartlet pans. You will have to roll, cut, gather scrapes and roll again (probably twice). Prick bottoms of pastry in tartlet pans. Place on cookie sheet and top each with parchment paper and pie weights. (I use dried lima beans). Bake until lightly browned. Remove weights and parchment paper. In a bowl, mix the cream and the egg yolks along with a pinch of nutmeg and the minced garlic. Season with Salt and pepper. Whisk all together. Divide the mixture among the tartlets and bake until set, Approximately 15 minutes. Add the kale, drizzle with a little olive oil and cook for a further 10 minutes or until crispy and the pastry is golden. 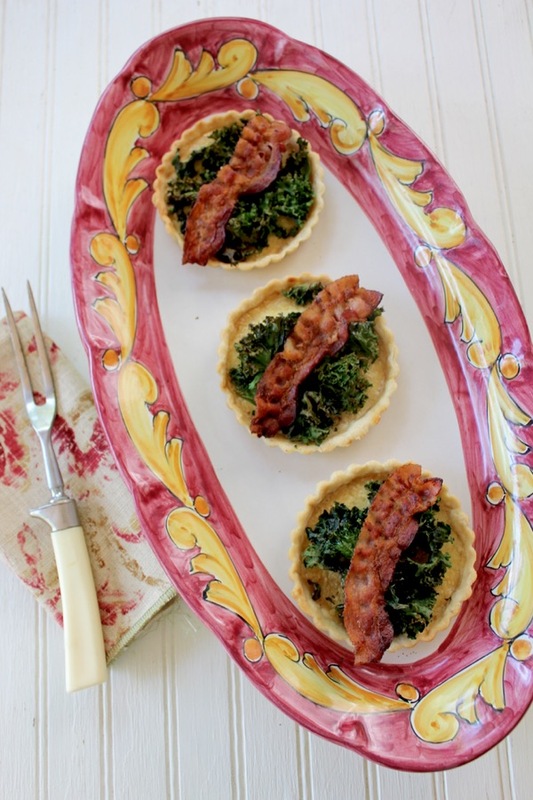 Place a slice of bacon on each tartlet and serve. Posted on May 18, 2017 at 12:37 pm. 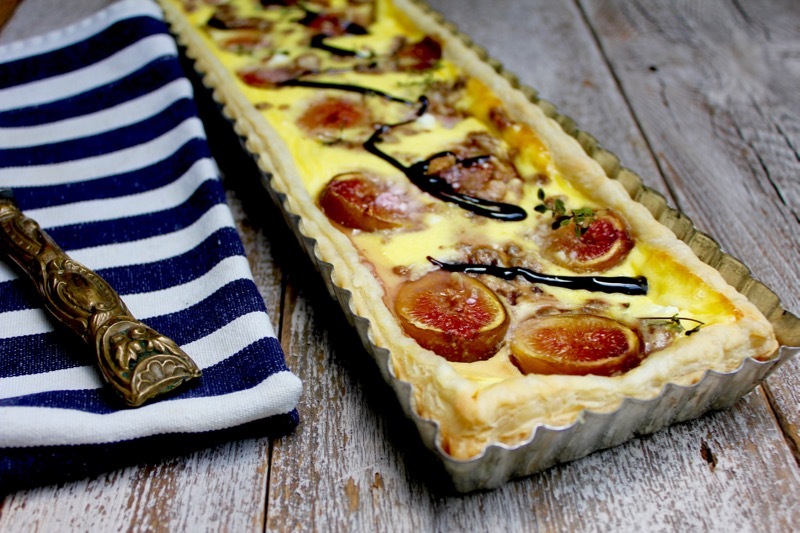 When figs are in season it is worth the time to make use of them in familiar and/or unusual preparations. They are wonderful as a component in an appetizer or used in a salad or a dessert. But they are also excellent in pizzas and tarts. Pared with goat cheese or Gorgonzola they shine. 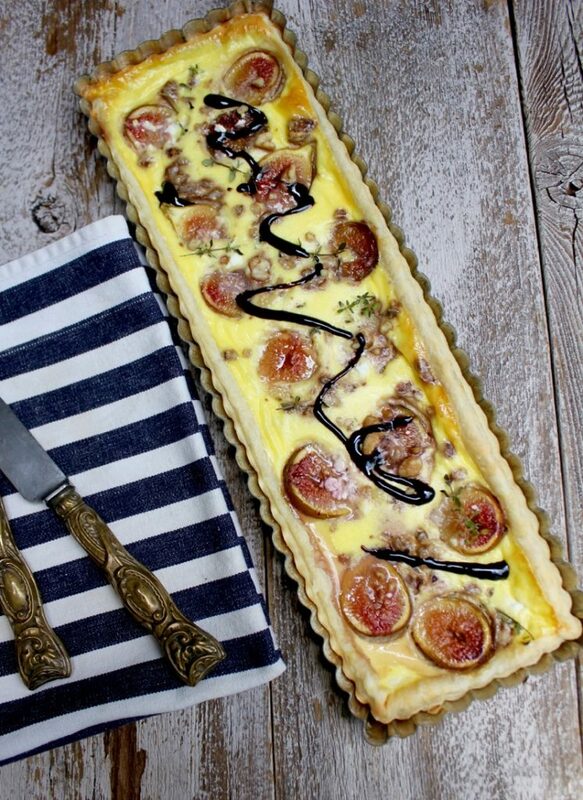 I adapted a recipe from a British magazine for a fig and goat’s cheese tart. It is a very easy recipe to assemble. It uses frozen puff pastry, so lining the tart pan is a piece of cake. But I must say that I would have preferred a homemade pastry crust. Puff pastry tends to be very flaky but somehow airy. I tend to like the more substantial weight of a pie crust. But, because of the ease of preparation, I was very happy with the results. A drizzle of balsamic glaze takes it over the top. It makes a delicious light supper with a salad of peppery arugula leaves. Dust the work surface with flour and roll the pastry out into a rectangle 1 inch larger than your pan. Lift it into the pan and press into the corners, lining the base and sides. Prick the base of the pastry case with a fork. Pop into the freezer for 30 minutes while you heat the oven to 400 degrees F. Place a baking sheet on the middle shelf. Beat the eggs and egg yolk with the cream until combined. Season well. Trim the stalk from each fig and cut the fruit in half. Pour the egg mixture into the pastry case. Crumble the cheese on top and arrange the figs evenly between, cut side up. Scatter with the walnuts and thyme sprigs. Slide the tart onto the tray and bake for 15 minutes. Reduce the heat to 350 and cook for 15 to 20 minutes longer. Remove it from the oven and leave to cool slightly. Serve drizzled with the balsamic glaze. Posted on August 8, 2016 at 8:17 am. This was such a quick and easy tart to put together. There is not much that puff pastry can’t do to make your life easier. It always makes a stunning presentation. 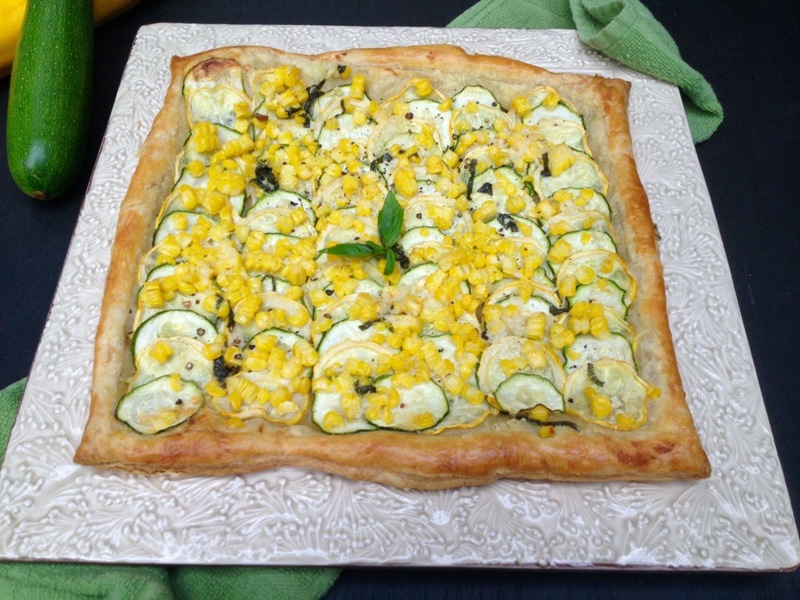 The hardest part of assembling this tart was slicing the zucchini on the mandolin. I have an aversion to that device. It is so sharp that it scares me. I made my husband do the slicing. We used both a green zucchini and a yellow zucchini, plus freshly shucked sweet corn. The flavors of garlic, butter and basil enhanced this lovely flaky creation. Enjoy it with a salad and a glass of Rose’ wine. I am having technical issues this week. My Son gave me a new computer that I am still trying to get used to. Then the lens that I always use for my photography stopped working. I had to use my fixed close-up lens. Hopefully I will have all of these issues settled by the time we leave on our trip. More news next week. Have a great weekend. 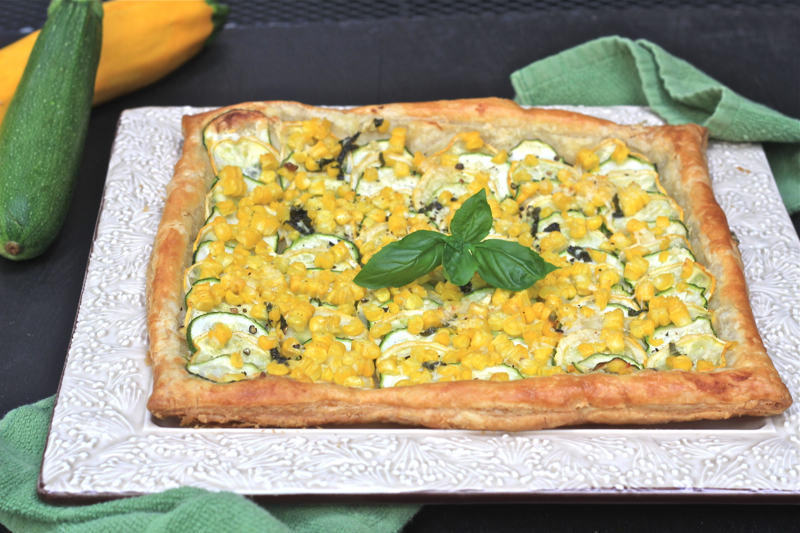 ZUCCHINI TART WITH SWEET CORN, BASIL AND PARMESAN (The Suburban Soapbox). Roll out the puff pastry on a parchment lined baking sheet. Using a paring knife, gently score approximately 1/4 inch from the edge to create a border being careful not to cut all the way through. In a microwave safe bowl, add the butter, basil and garlic. Heat in the microwave for 30 seconds or until the butter is melted. Brush half the butter mixture on the puff pastry inside the border. Arrange the zucchini on top of the butter and top with the corn. Sprinkle the parmesan over the tart and drizzle with the remaining butter. Season with salt and pepper. Whisk the egg yolk with 2 tablespoons of water. Brush the border of the puff pastry with the egg wash and transfer to the oven. Bake 20-25 minutes or until the edges are puffed and golden brown. Transfer to a serving platter and serve warm or at room temperature. Posted on September 4, 2015 at 8:41 am. In French this tart is called Flamiche Aux Poireaux. It is popular north of Paris in the villages of the Picardy region. 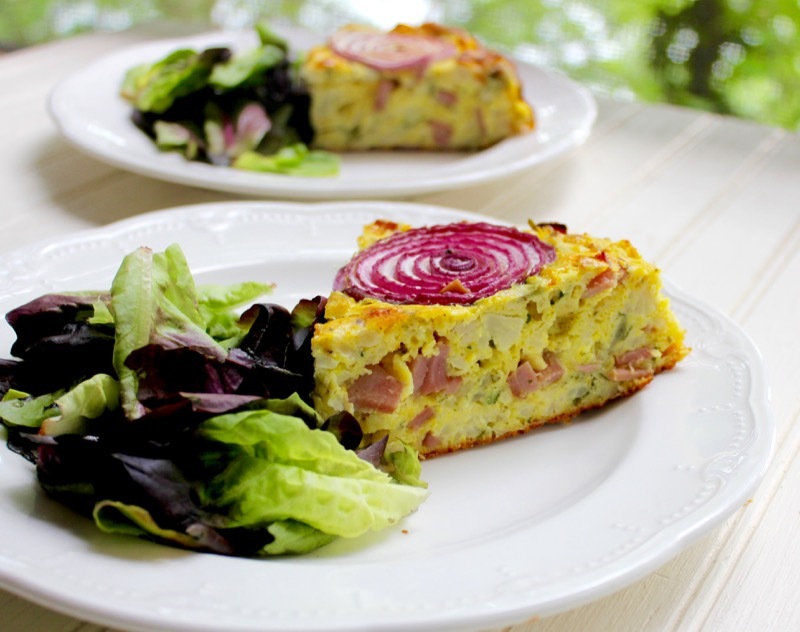 It is different from a quiche in that the emphasis is more on the vegetables than on the custard. In this case leeks play a starring role. It is also studded with Parma ham (Prosciutto) and Gruyere cheese. This was a perfect Sunday supper to enjoy on the lanai on a warm Florida evening. The first few days back in Florida always feel like a vacation; warm breezes, sunny skies and catching up with friends. The food choices are different too. The local Publix carries a wider selection of meats and vegetables than does the Ingles at home. 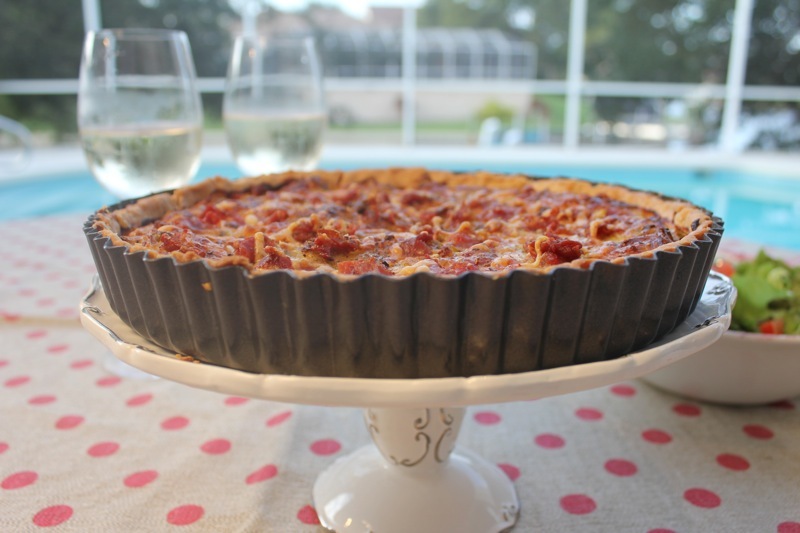 So getting good quality prosciutto for this tart was not a problem. The leeks were another story. They are very expensive right now. The recipe that I was following came from Patricia Wells and she recommends three pounds of leeks. The leeks at the supermarket were 2.99 a pound and that seemed excessive to me when I had to buy expensive prosciutto and expensive Gruyere cheese. So I cheated a little and bought 2 pounds of leeks and added a large onion to the mix. 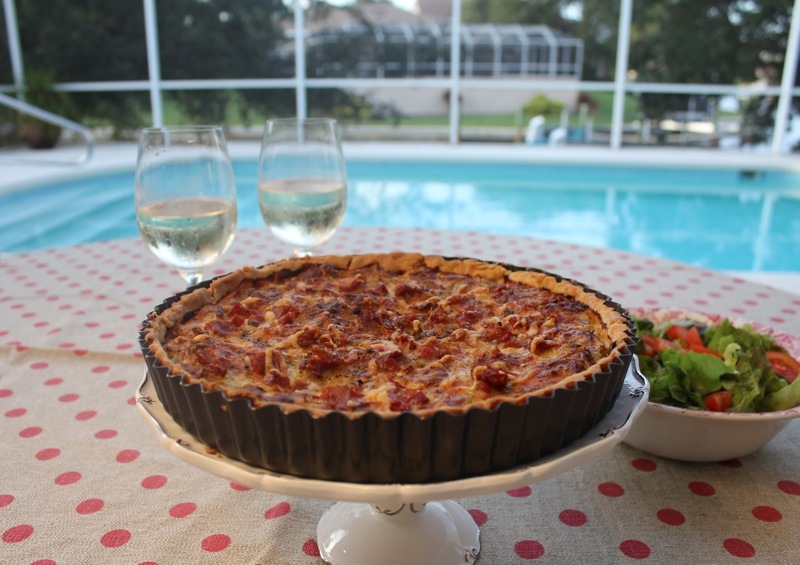 So being still in vacation mode, I made the tart, tossed the salad, poured the wine and sat on our sunny lanai and ignored the mold on the concrete and the weeds growing in our planters. There is time for pressure washing and new plantings later. 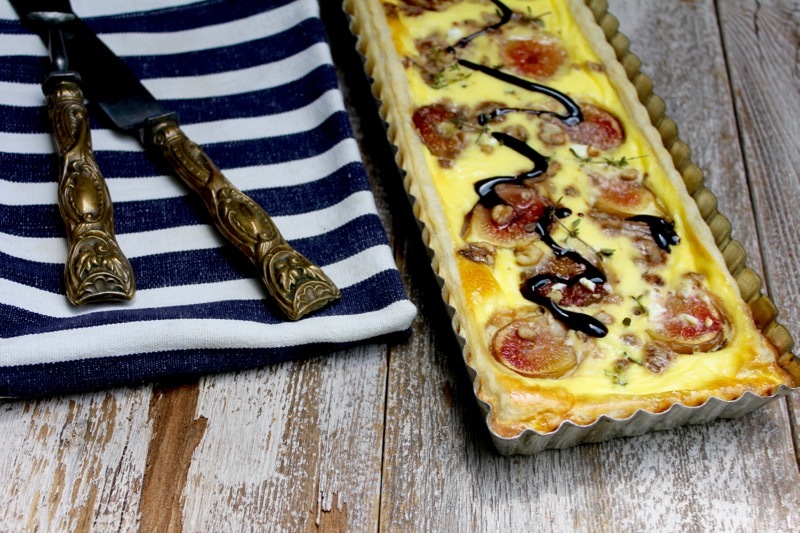 This tart is worthy of a glorious relaxing evening. Prepare the pastry shell: Roll out the dough to line a 9-inch tart pan. Carefully transfer the dough to the pan. Chill for 30 minutes, or until firm. Prepare the filling: Trim the leeks at the root. Cut off and discard the fibrous, dark green portion. Split the leeks lengthwise for easier cleaning, and rinse well in cold water until no grit appears. Coarsely chop the leeks. If using an onion, coarsely chop it also. Melt the butter in a medium-size saucepan over low heat. Add the leeks and onion if using, salt, and pepper to taste and cook, covered, until the leeks are very soft but not browned, about 20 minutes. If the leeks have given up an excessive amount of liquid, drain them in a colander. Combine the eggs and cream in a medium-size bowl and mix until throughly blended. Add the leeks and mix again. Reserve 1/4 cup each of the ham and the cheese to sprinkle on top of the tart. Mix the rest into the leek mixture. Pour the leek mixture into the prepared pastry shell. Sprinkle with the reserved ham, and then the cheese. Season generously with freshly ground black pepper. Bake until nicely browned, 40 to 45 minutes. Serve warm or at room temperature. 6 to 8 servings. Posted on November 11, 2013 at 2:22 pm.